I have caught the gardening bug. My eldest daughter wanted to start up a small flower garden for herself and I had been thinking about fixing up the tear drop garden in our front yard and starting a few veggie gardens. Tamika mentioned to my mum that she wanted to start a garden (my mum is the one with the green thumb in our family) so she said she would come out Wednesday for the day and help out. She arrived mid morning armed with a pitch fork, shovel and some plants. We all spent the morning digging up the grass and weeds where Tamika wanted her garden, then husbeast (he had the day of work) came and constructed a box out of red gum timbers for us. After a quick lunch/cuppa break we got stuck back into it filling it with soil and plants. After almost a full days work we had one cute little garden. It was one of the best days the kids and I have had in a long time! I have moved the chicken coop to where I plan on putting the next one, they can do all the hard work of digging up the grass for me this time! 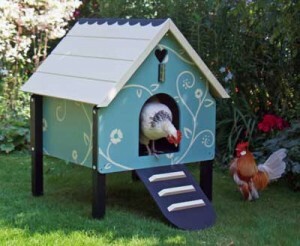 Speaking of chicken coops, how cute are these coops I found online the other day!! Tomorrows job is to start digging over the tear drop and digging out all the old dead plants! I have discovered how therapeutic gardening is and I'm loving it!